Tomorrow begins our celebrations of Pancha Ganapati! Here is a refresher course for the details of each day. Pancha Ganapati is a modern Hindu festival of the Five-Faced (Pancha means "five") Mah Ganapati--Lord of Categories. This festival falls during the thirty days of the Markali Pillaiyar home festival and lasts for five days--from December 21 through 25. The winter solstice has always been a festive time of year in all countries and religions, among Hindus especially, for it is a traditional season for the worship of Lord Ganesha. In Hindu Vedic Astrology this time of year marks the end of the sun's southward movement and the beginning of its movement north, the change from dakshinayana to uttarayana. Since Hindus do not celebrate Christmas, they often find it difficult to relate in a meaningful way to those who do. Their children are often embarrassed when asked why they do not receive gifts on December 25. Adults feel the need to give gifts and mail greeting cards as well as receive them from their relatives, neighbors, friends and business associates. Pancha Ganapati is a Hindu expression of this natural season of worship, gift-giving and celebration. December 25 and the days that precede and follow it have truly become a special time of year for people of many religions, and for the non-religious as well. In fact, this season has become so universally popular that it has virtually become a secular cultural holiday in addition to its special observance by certain religions. Recognizing this fact, the U.S. Supreme Court ruled Christmas a secular, social holiday. This is because it has become a time for everyone to rejoice, give and share their abundance, each in his own way. Pancha Ganapati is not a temple utsava; it is a contemporary home observance. Because of the importance of this festival as a new beginning and mending of all mistakes of the past, a festive shrine is created especially for the five-day event in the main living room of the home. At the center of the shrine is placed a large wooden or bronze five-faced statue of Lord Pancha Ganapati. If this is not available, any large picture of Lord Ganesha will do. The home shrine is decorated in the spirit of this festive season. Lord Ganesha is often depicted as coming from the forest; therefore, pine boughs (or banana leaves) may be used. Druva grass, sugarcane and garlands of sweet modaka balls are used to decorate the home shrine. Flashing lights, tinsel and colorful hanging ornaments may also be added. Pancha Ganapati is dressed anew each morning, preferably by the children, in a special color for that particular day. His five Shaktis are loved and adored by all members of the family. He appears in golden yellow on December 21. A regal gown of royal blue is presented to Him on December 22 and one of ruby red on the 23rd. On December 24 He appears in emerald green; and on the final day Lord Pancha Ganapati comes forth in brilliant orange to bless all who visit Him, bestowing 365 days of wealth and abundance until returning again next year in the form of Pancha Ganapati. Pancha Ganapati should be celebrated in a distinctly Hindu way. The items which should not be used are Christmas trees, Santa Claus or symbols of other religions. These symbols carry connotations that are to be avoided in Hindu worship. Season's greeting cards should be Hindu in design and content. Season's greetings to friends in other religions can continue with thoughts of Hindu wisdom or quotes from Hindu scripture. If properly chosen they will be appreciated and cherished. Pancha Ganapati is a joyous time for the family and should include outings, picnics, holiday feasts and exchange of cards and gifts with relatives, friends and business associates. Each day a traditional offering tray of sweets, fruits and incense is offered to Pancha Ganapati, often prepared and presented by the children. Each day gifts are given to the children, who place them unopened before Pancha Ganapati, to open only on the fifth day. After each puja, the sweets are given to them from the offering tray as prasada. Gifts need not be extravagant or expensive; they should be within the means of each family. Handmade presents are by far the most precious. Ganesha does not want gift-giving to promote Western commercialism but to further the great Hindu culture. Clearly, killer games should never be given. Greeting cards, ideally made by the children, offer Hindu art and wisdom, such as verses from theVedas. During each of the five days of Pancha Ganapati, chants, songs, hymns and bhajanas are sung in His praise. Each day a different family sadhana is focused upon. The first sadhana begins the morning of December 21 and the others begin each day thereafter until the fifth and final day, December 25. The family sadhana for the first day of Pancha Ganapati is to create a vibration of love and harmony among immediate family members. The day begins early, and the entire family works together to design and decorate the shrine with traditional symbols, rangoli, lamps and more. Then a grand puja is performed invoking the spirit of Pancha Ganapati in the home. The sadhana of the day now begins. The family sits together for the purpose of easing any strained relationships that have arisen during the year. They make amends one with another for misdeeds performed, insults given, mental pain and injuries caused and suffered. When forgiveness is offered to all by one and all, they speak of each other's good qualities and resolve that in the days ahead they will remember the futility of trying to change others and the practicality of changing oneself to be the silent example for all to witness. Gifts are then exchanged and placed unopened before Pancha Ganapati. As family harmony is important to all Hindus, this sadhana must be taken very seriously. The family sadhana for the second day of Pancha Ganapati is to create a vibration of love and harmony among neighbors, relatives and close friends and presenting them with heartfelt. The sadhana of the day is to offer apologies and clear up any misunderstandings that exist. Relatives and friends in far-off places are written to or called, forgiveness is sought, apologies made and tensions released. Gifts received are placed unopened before Pancha Ganapati. The family sadhana for the third day is to create a vibration of love and harmony among business associates, the casual merchant and the public at large. This is the day for presenting gifts to merchants and customers and to honor employers and employees with gifts and appreciation. The sadhana today is the settling of all debts and disputes. Gifts received are placed unopened before the Deity. The sadhana of day four is to draw forth the vibration of joy and harmony that comes from music, art, drama and the dance. Family, relatives and friends gather for satsanga to share and enjoy their artistic gifts. When the program is over, all sit together before Pancha Ganapati, Patron of the Arts and Guardian of Culture, discussing Hindu Dharma and making plans to bring more cultural refinements into each household. More gifts are placed before Lord Ganapati. The family sadhana for the final day of Pancha Ganapati is to bring forth love and harmony within all three worlds. Because of sadhanas well performed during the first four days, the family is now more open and aware of Ganesha's Grace, and their love for Him is now overflowing. On this day the entire family experiences an outpouring of love and tranquility from the great God Himself. His blessings fill the home and the hearts of everyone within it, inspiring them anew for the coming year. This exchange of affection between all members of the family and the Lord is invoked and perpetuated through the day by performing five special pujas. The first puja is at 6am. Before the puja, personal offering trays are prepared and placed before His shrine. After the puja, each one gives verbal testimony about prayers that were answered during the past year. Hearing testimonies strengthens the faith of everyone. Then vows of sacrifice can be verbally made. Vows should improve the quality of the life of the individual, such as giving up smoking or correcting other harmful habits. The second puja is at 9AM, and the third at 12 noon. The fourth puja is held at 3PM.At 6PM the fifth and final puja of the day is held. These five pujas to Pancha Ganapati solicit help from His devas in the home and establish the patterns for improvement in family life. The overflowing love that is felt today will inspire generosity in the year to come, bringing in return abundance and good fortune. All gifts received during the day are placed unopened before Pancha Ganapati. The evening puja, held at six o'clock, is the long-awaited time. The five sadhanas have been completed. Peace, love and harmony among everyone have been restored. After the puja and before the great feast that follows, Lord Panchamukha Ganapati Himself gives His final darshana and prasada to one and all. Gifts are distributed and joyously opened. Happy children. Happy parents. Happy God. This entry was posted on Thursday, December 20, 2018 at 10:02 am and is filed under Festivals. You can follow any responses to this entry through the RSS 2.0 feed. You can leave a response, or trackback from your own site. It is so true that "everything was finish long ago." While we don't always plan the timing for certain events related to Iraivan, the temple has its own magical way of making things happen. Though not originally planed, after many years the Avudaiyar was moved from storage into Iraivan Temple on Skanda Shasti day. Just a few days ago, the siplis and the monks of the Siddhidatta Kulam were able to make the final move of the Avudaiyar on Krittika Deepam day, a major Saiva puja day and a festival closely associated with Iraivan Temple. For the next few thousand years or more it will be here! This entry was posted on Sunday, November 25, 2018 at 5:35 pm and is filed under Construction, Festivals, Temples. You can follow any responses to this entry through the RSS 2.0 feed. You can leave a response, or trackback from your own site. On November 5th the Aadheenam observed the 227th Chitra padapuja to Gurudeva Sivaya Subramuniyaswami. This, at the end of four days of morning pada pujas and classes for pilgrims. 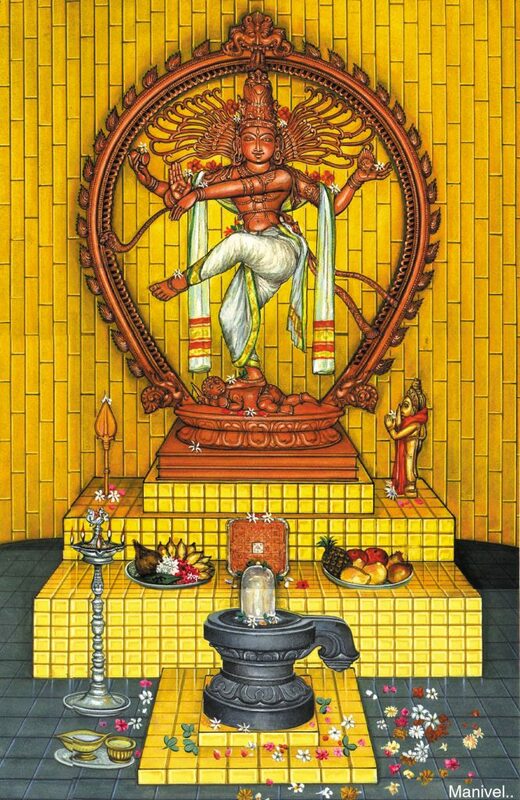 Sivachariyar Kumar Gurukkal performed the elaborate homa and the following abhishekam to Gurudeva's tiruvadi. This entry was posted on Friday, November 9, 2018 at 11:18 am and is filed under Festivals, Gurudeva. You can follow any responses to this entry through the RSS 2.0 feed. You can leave a response, or trackback from your own site. On the second afternoon of our Mahasamadhi festival the group paraded tiruvadi from Gurudeva's shrine out to Umbrella Ganesha, Iraivan Temple, the Swayambhu Lingam, Rishi Nandinatha and Rishi Tirumular, and finally to Dakshinamurti. This entry was posted on Monday, November 5, 2018 at 10:15 am and is filed under Festivals, Gurudeva. You can follow any responses to this entry through the RSS 2.0 feed. You can leave a response, or trackback from your own site. Yesterday afternoon, visiting pilgrims enjoyed a class with Satguru Bodhinatha Veylanswami. Early this morning everyone joined in Kadavul Temple for a short puja to Gurudeva's tiruvadi. This entry was posted on Saturday, November 3, 2018 at 10:32 am and is filed under Festivals, Gurudeva. You can follow any responses to this entry through the RSS 2.0 feed. You can leave a response, or trackback from your own site. This morning the monastery began the new phase. This phase is our annual festival for the the 2001 Mahasamadhi of Satguru Sivaya Subramuniyaswami. This week, close devotees from around the world visit the aadheenam and enjoy special pujas and classes with Satguru Bodhinatha Veylanswami and other swamis. This morning was day one, and we began with a homa. It was also an auspicious time for Shanti Suresh, visiting from California, to take samaya diksha, receiving a blessing from Satguru to chant the sacred manta "Aum Namah Sivaya." This entry was posted on Friday, November 2, 2018 at 11:15 am and is filed under Festivals, Gurudeva. You can follow any responses to this entry through the RSS 2.0 feed. You can leave a response, or trackback from your own site. Recently we held the annual Ayudha Puja, blessing the many tools that make Iraivan temple possible. This puja is a part of Navaratri and while the monastery doesn't observe this festival, ayudha puja is considered an important event, with special prayers for all tools all machinery used by the silpis. Traditionally, the first stone for a new project is blessed on this day, and today that was the first stone in the next layer of the Nandi Mandapam. After the short puja and blessings, Satguru gave gifts to each of the Siplis. Aum. This entry was posted on Saturday, October 20, 2018 at 10:09 am and is filed under Festivals, Temples. You can follow any responses to this entry through the RSS 2.0 feed. You can leave a response, or trackback from your own site.